First of all, a bit of history if you’re unfamiliar with the notion itself. Back in 2014, the Federal Accounting Standards Board (aka FASB) in partnership with the International Accounting Standards Board (or IASB) came up with new rules on regulating revenues from contracts known as ASC 606. Initially, it affected only public organizations: they had to follow the standards for annual reporting starting from December 15, 2017. As for now, more than four years later, all businesses reporting under US GAAP will have to report revenue under ASC 606 for fiscal years from December 15, 2018, and on. The emergence of this new standard has a number of major reasons behind. 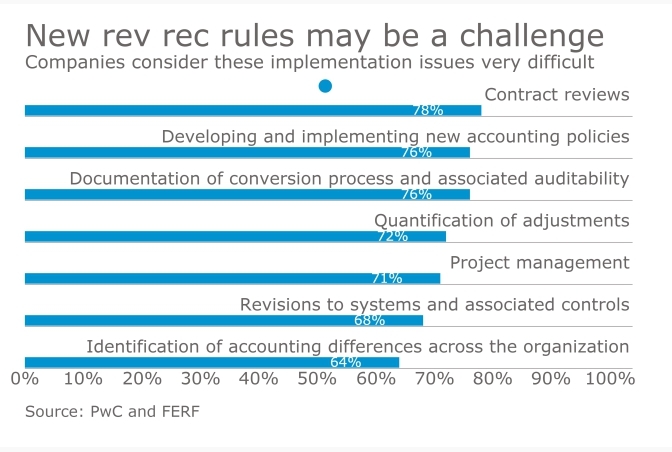 Historically, there’s always been a drastic difference between GAAP and IFRS in regards to how they judge revenue recognition and disclosure requirements. Thus, ASC 606 principles were crafted to simplify and unify revenue recognition practices across industries as requirements for reporting revenue vary within various jurisdictions and markets. However, revenue recognition is a critical benchmark if we talk about evaluating the financial performance of a business. In a nutshell, the newly-made standards serve one common principle: companies must identify revenues when transferring their merchandise or services to its clients, matching the amount of consideration expected in exchange for corresponding commodities and services. Five step guidelines have been designed for both individual and group contracts to keep them in conformity with ASC 606 principles. While the steps above may seem pretty straightforward, the devil is in the details as they say. Industry professionals claim that the adoption of ASC 606 standards represents a principally difficult task for subscription-based companies at every step of the model. Let’s find out what lies ahead for them. It would be fair to say that subscription plans change now and then: for instance, a customer may upgrade or downgrade his plan. Naturally, changes within a contract are regarded as the norm for this field of business. However, these changes may not be in tune with the rhythm of the compliance step number one – the identification of the contract. Or, in some cases, contract changes are considered as a modification of the current contract. In other situations, there’s a need to draw up a new contract. This way, this new reality impacts revenue recognition. The remainder of the steps – from 2nd to 5th – creates even bigger ambiguity. For instance, how can you possibly regulate the variety of subscription characteristics? What about so-called evergreen subscriptions (which have no end)? Or non-refundable fees you sometimes have to pay upfront? Should they be recognized at once or not? And, surely, the point number 3 has a lot of mental pabulum to offer. The main question is how can we regulate usage-based pricing in regards to transaction price? All these questions add a new level of difficulty towards the tracking of contracted, recognized, and deferred revenue. Firstly, in order to achieve compliance, companies will have to adjust their sales and marketing efforts. Contract designs and pricing models should be put on the list of things to urgently change, not to mention that organizations will have to rearrange the way they manage their sales teams. And what about discounts? Let’s imagine a client purchasing a subscription for a certain number of seats. The overall price per seat is reduced, no matter if we talk about future additional seats or the previously-purchased ones. This situation has nothing in common with forecasting business’ growth as contracts will be modified on the spot and prices will be continually changing. But let’s look on the bright side and shed some light on organizations which managed to benefit from changed rules. That would be, among others, Aetna Inc., an American managed health care company, which expects ASC 606 to increase its revenue and expense by whopping $2.0 billion. Universal Technical Institute, as one of the early adopters of the new accounting standard, will benefit from a non-cash increase to equity of approximately $37.2 million as of October 1, 2018. Again, it would be safe to predict that this new standard will provide organizations with a big chunk of hesitation at the moment when they begin to incorporate ASC 606 into their reporting. However, one just can’t ignore this issue, so the first step for subscription-only and mixed business model firms is to embrace this new reality. At first, they should address some specific features of their business models such as discounts over certain periods of time, pricing plans based on usage, bundled products, evergreen subscriptions and ramp pricing. As the financial landscape is continually changing, the next step is the choice of a technology solution which is capable of keeping them in compliance with changes in ASC 606 as these new accounting standards represent (and won’t cease to represent) a serious challenge for CFOs and their teams. Historically, the growing list of international trade regulations and tax reforms policies have a significant impact on businesses’ principles and practices. The new direction will make companies to revamp the way they calculate their revenues and whether it’s time to resort to automation. This way, the right technology solution is essential for long-term success of subscription-based businesses. These solutions can be integrated either through an API or middleware to guarantee the proper accounting for revenue and, accordingly, the compliance with ASC 606.